Remove from fridge and add 425gm flour. Do not add all flour at once, as amount of flour could vary depending on the size of the eggs used. Stir mixture with a wooden spoon. Knead dough on a floured surface, to form a smooth dough. If the dough is sticky, add more flour. From the kneaded dough, divide into small, round balls of dough. You can use a melon scoop to ensure that your balls are all the same size. Ensure that the balls are smooth and round. Place on baking paper in baking tray and bake for approximately 20 mins at 170 degrees Celsius or until light brown. Remove from oven, and allow to slightly cool. While balls are still warm, use a sharp knife to remove the inside of the ball. Do not throw away the inside, as we will be using these crumbs in the filling. Combine the jam with the crumbs from the inside of the balls and start filling each ball with the filling mixture. Join 2 halves together with the filling and clean off any excess. Fill 2 small bowls with water and add red food colouring to one bowl and orange food colouring to the other bowl. Note: the more food colouring you add, the stronger the colour. Optional: add raspberry extract to the red food colouring, and pear extract to orange food colouring for added flavour. Note: you can use other flavour combinations. To colour the peaches, you can dip different sides of the peach in the red colouring and the other sides in the orange colouring. You may need to dip 2 to 3 times to get a rich colour. If you prefer, you can paint the colour on instead by using a brush. Place the peaches on some paper towel to dry. 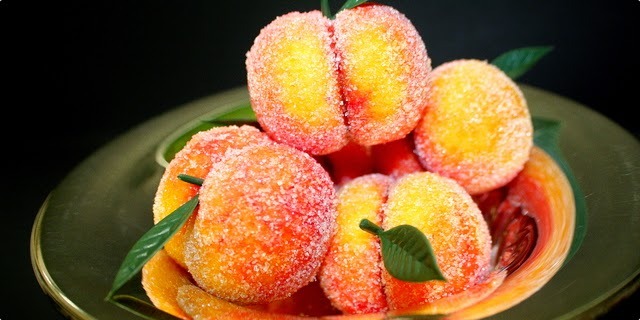 Roll the peaches in white sugar and leave overnight.